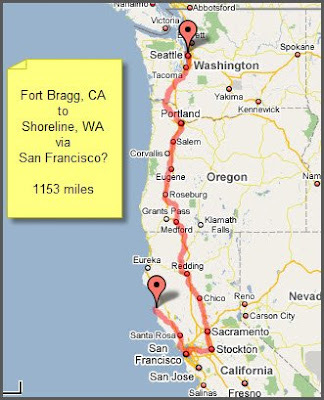 Walking Fort Bragg: Step one. gittin there! No walking but a lot of gawking today as I set off on my journey. I have a 1:30PM appointment at the VA Hospital in San Francisco for starters. They want to ultrasound my thyroid. Then over the Bay Bridge to my Sister and Brother-in-law's in Dublin for the night. I'll show you what I saw along the way tomorrow morning. Good luck with the ultra sound. I prefer ultrasounds to just about any other procedure (if I have to undergo them. I hate 'procedures'.) I hope your thyroid is doing fine. We'll stand by until you get settled. Drive safely; did I mention those crazy Seattle drivers? Blessings on your way. Maybe you can connect with Chuck Pefley once you're settled in.